New Item available in multiple widths! 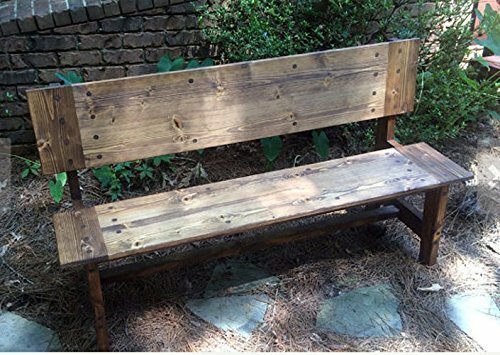 The mr² Farm Door Bench or Seat is 19" deep x 32" high and comes in widths between 24 and 72 inches. The chair and benches shown are stained English Chestnut and Walnut with a satin finish. 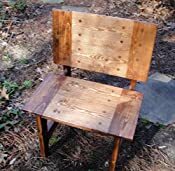 Each piece is built to the following specifications: - The seat and back is made from ¾ inch Knotty Pine Boards with biscuits and compression glued. - The back and seat is reinforced with multiple ribs for maximum strength and support - Simulated screw and dowel holes. - 1 3/8" x 3 1/4' Knotty Pine is used for the Leg Assemblies and Cross Brace - The Cross Brace between the Leg Assemblies is for rigidity, strength and stability. - The bench is shipped fully assembled. - Wood screws covered by pine dowel are used to reinforce the leg assemble joints. - Each piece is finished with the customers specific stain requirements and multiple coats of lacquer are then applied. The surfaces are sanded prior to the application of the next coat. All of the surfaces are finished with lacquer. - Each piece is wrapped in multiple layers of bubble wrap, cardboard and then placed in cartons. There are two cartons to minimize weight and shipping costs. - The bench or seat is stained and finished to the customers specific requirements. Please specify the stain and finish when ordering. - Finished samples are provided for approval before finishing. - Shipment in 20-30 days depending upon the backlog. - Drop shipment to the closes Greyhound Package Express Station has been included. Residential shipping is also available for an additional fee. If the actual cost is lower when shipped, a refund will be applied. 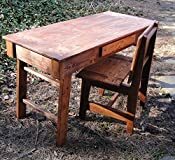 - Matching Farm Door desks, tables and wider benches are also available on this website. Not for outdoor use. Shot outdoors to show the grain patterns and stain color.